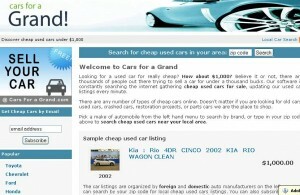 If you are unfamiliar, Cars For a Grand is a relatively new website that organizes all of the cars listed on Ebay Motors under $1000.Â The premise is simple, right?Â Then why didn’t you think of it?Â To launch the site and get some publicity simultaneously, Chris Hedgecock and Jorge Gonzalez, founders of Cars For a Grand, decided to buy one of the cars listed and drive cross-country to drum up support, traffic, and to prove without a doubt that you do not need to spend a fortune for reliable transportation. You do not have to be a genius to get people interested.Â You need a good product and personable people to promote it.Â On their journey from San Diego to Miami beach, Chris and Jorge stopped along the way to speak with numerous local television stations and newspapers which helped create traffic for the site, and even more exposure.Â It seems that when one news outlet decides to pick up a story, local competitors are anxious to do the same.Â All of these appearances on local (and National) news broadcasts brought hundreds of thousands of page views to the site.Â The moral: Not only do you need not be a marketing genius, you do not even necessarily need a budget for marketing, if the product and circumstances are right. These two guys took what most would consider a piece of junk car, and drove it cross-country.Â It cost them $899.00 and 3800 miles later, it still runs great.Â Just goes to show that you can still get deals on old vehicles and save thousands on interest from loans.Â (Maintenance on these vehicles will likely be higher than normal though).Â Even so, for less than 5 months of car loan payments, these cars can be yours with a clear title! You do not have to invent something or build something to have a successful idea.Â Even simple ones can be a huge success if it provides a viable service for customers.Â These guys took products from elsewhere, organized them better, and viola! A great website that offers links to worthwhile products for perspective consumers. It really is impressive.Â I read a story about these guys and instantly felt inspired.Â No money? No problems!